Upon reaching the load areas, say a town or city, the high transmission voltage must be "stepped down" to lower transmission levels sometimes called sub-transmission for safety and flexibility of handling in a congested area. 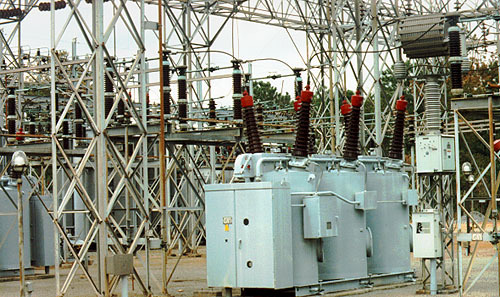 Such voltage step-down is accomplished at a "transmission substation," which is basically a transformer surrounded by high voltage switches and circuit breakers. Customers are not typically served directly from transmission substations. Any customer requiring transmission level service will usually be fed from a sub-transmission circuit coming out of the transmission substation.